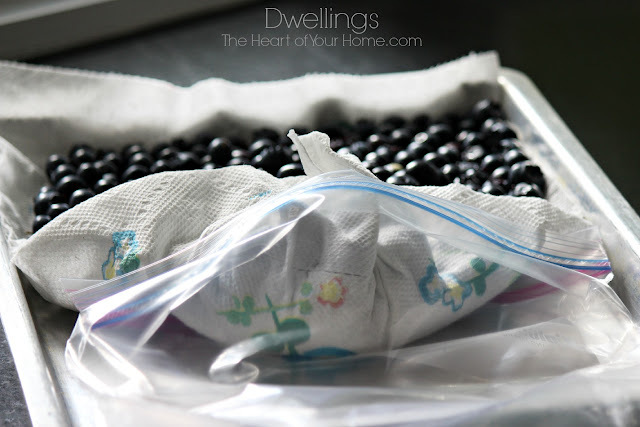 These little berries are packed full of health benefits B U T they are expensive! 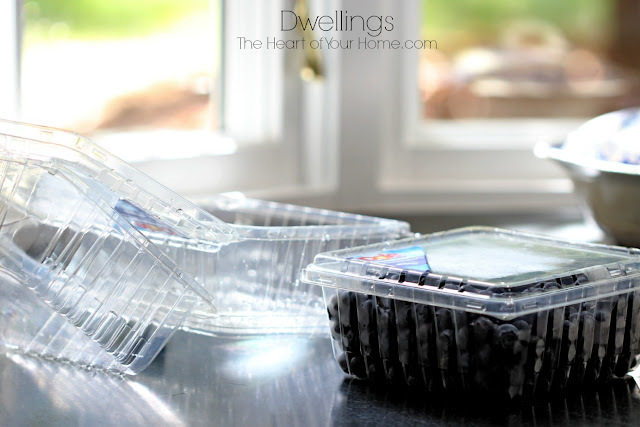 I never purchase fresh blueberries at the grocery store; the container is tiny and just cost too much! 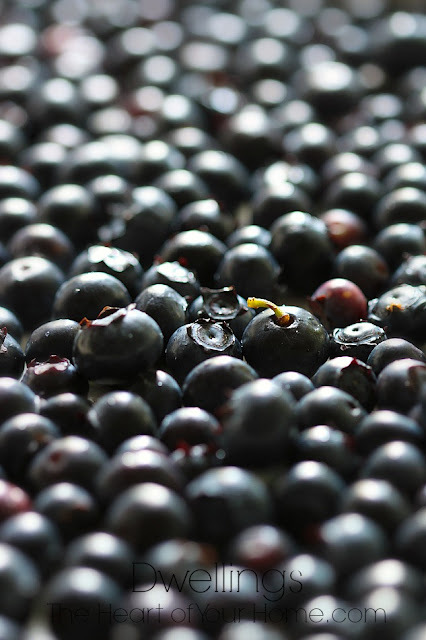 And though frozen blueberries are more reasonably priced, when purchased at the grocery they are usually small, with tough skin and very little flavor. So I take advantage of summer's bounty by freezing these power packed berries! I buy them cheap and freeze enough to last all winter. 24% of daily vitamin C, 5% of vitamin B6 and 36% of vitamin K needs. They also provide iron, calcium, potassium, magnesium, phosphorus, sodium, manganese, zinc, copper, folate, beta-carotene, folate, choline, vitamin A and E! Wow! 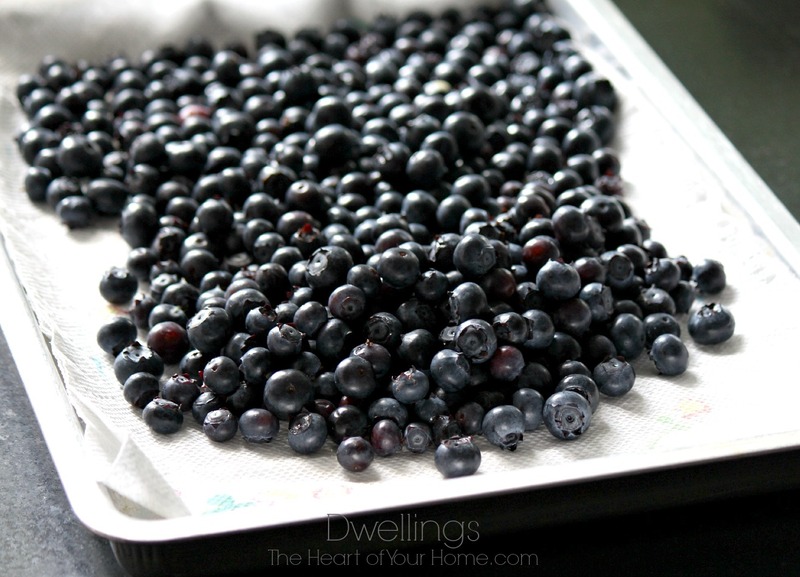 These little berries are full of goodness! Most mornings, along with my scrambled eggs, I have a bowl of strawberries and blueberries. They are frozen, so I place them in the microwave for about 30 seconds, just enough to unfreeze the berries but leaving them very, very, cold. That's how I like 'em! The mister enjoys oatmeal for breakfast, so I top the bowl off with a drizzle of honey and lots of blueberries. By the time he has finished his cup or two of coffee and begins eating, his hot oatmeal has thawed the berries. That's how he likes 'em! We use blueberries in our smoothies too! We are fortunate to have a Costco near us and their brand of frozen strawberries are large, bright, and full of flavor. Since this brand of strawberries is so good, I buy them rather than freezing my own, but as I mentioned above, most frozen blueberries leave a lot to be desired. Since they also have large containers of fresh blueberries that are very reasonably priced, I freeze my own. 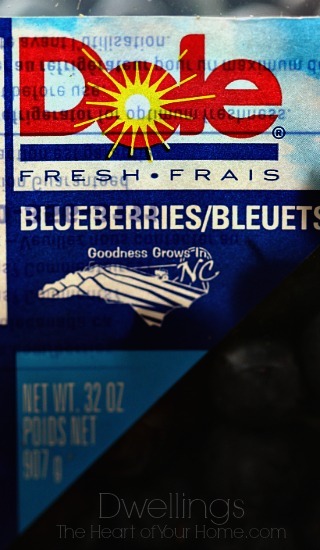 They aren't always the Dole brand (but I do like that these were grown here in NC!) but a 32 oz size can be purchased for only $6 or so...that's a GREAT price for fresh, large, plump, blueberries. When the container size is large and the price reasonable, I start stocking up. Each trip, I will purchase 3 or more containers to wash and freeze. My favorite kitchen gadget is my salad spinner, I love this thing! Yeah, I know they say the prepackaged salad, broccoli, etc., has been washed...but I wash it any way. Actually, there isn't much that I don't soak and spin in my salad spinner, including blueberries. Here I have opened two 32 oz. containers of blueberries and poured them in the spinner. After filling with water, I let them soak a bit. cleaning off anything debris has floated to the top and pulling off any stems that may still be attached. 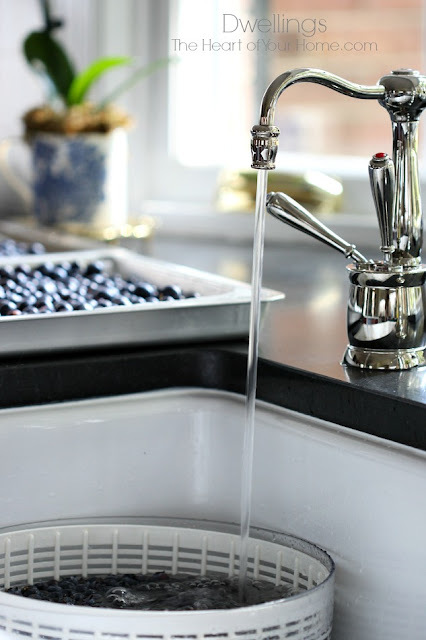 I drain the water from the blueberries and spin them dry. 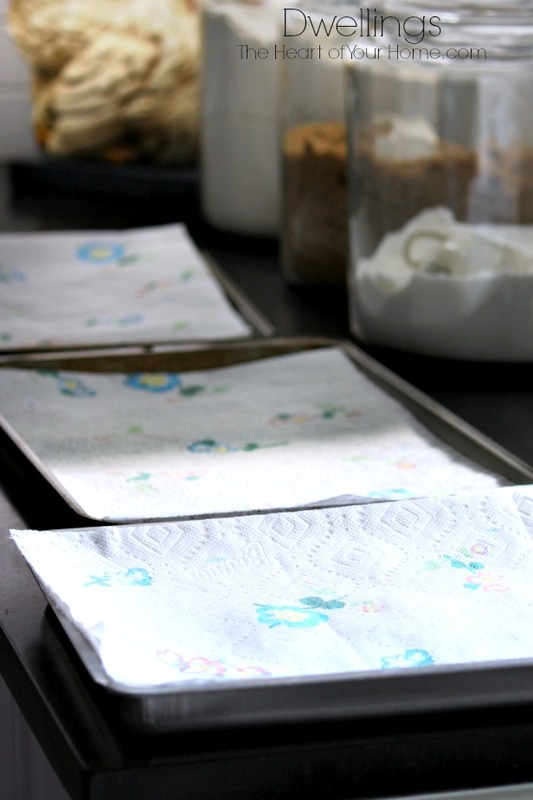 While they are spinning, I prepare several cookie sheets, lining each with a double thickness of paper towels. When the spinner has finished spinning, I pour a layer of blueberries on the cookie sheets. There are enough blueberries so when I give the cookie sheet a little shake, there will be one layer. If there are more blueberries to wash, I open the next package and start the process over while the first batch is drying. After gently shaking the cookie sheet to help dry the single layer of blueberries, I look them over to remove any stems I may have missed. I begin moving the blueberries back a bit from the top and sides of the cookie sheet. 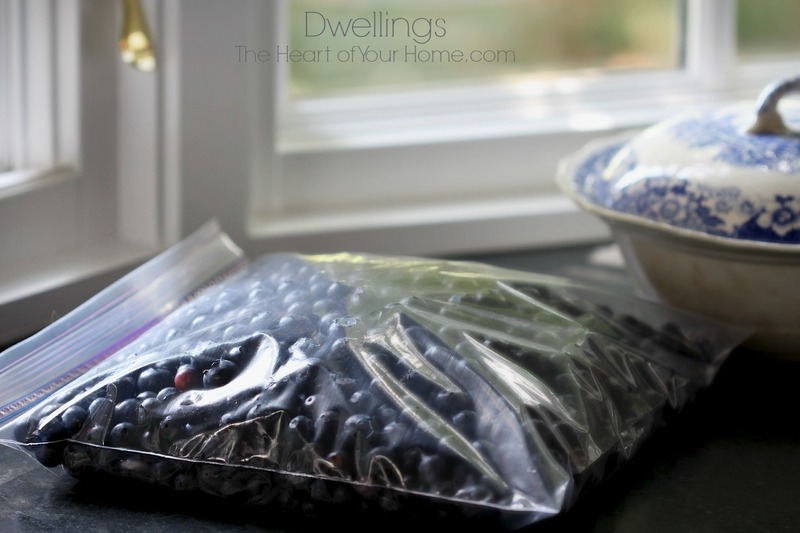 I use gallon sized Ziploc bags to freeze my blueberries and I have tried several ways to get my clean, dry, blueberries in the bags and they would end up rolling all over the place! I keep a few Ziploc bags close by with the ends unzipped. I then gather the top and sides of the paper towel where the blueberries have been pushed back and begin curling the paper towel around and over the front section of the blueberries and then begin sliding the Ziploc bag underneath the gathered paper towel full of blueberries. Remember to have a double layer of paper towels, or they will tear apart. 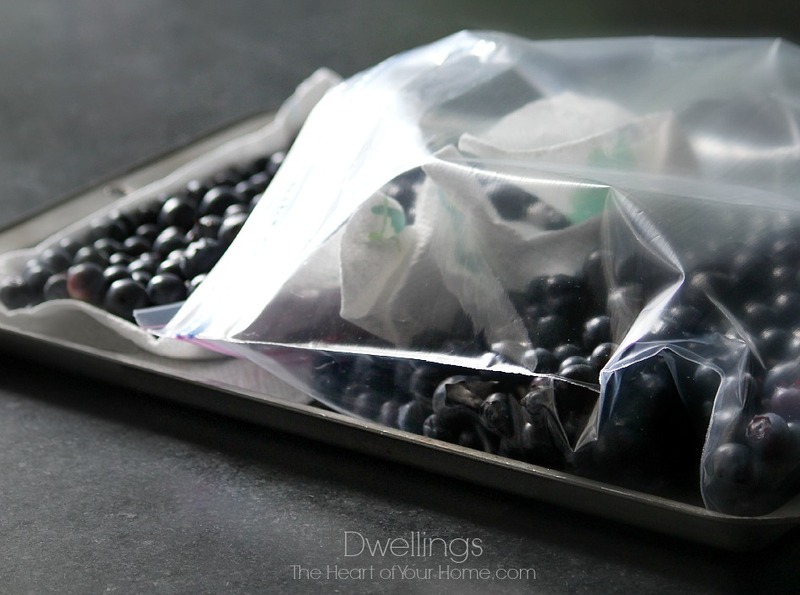 Once the top section has been worked down into the Ziploc bag, I begin inching the rest of the paper towel and blueberries into the bag. 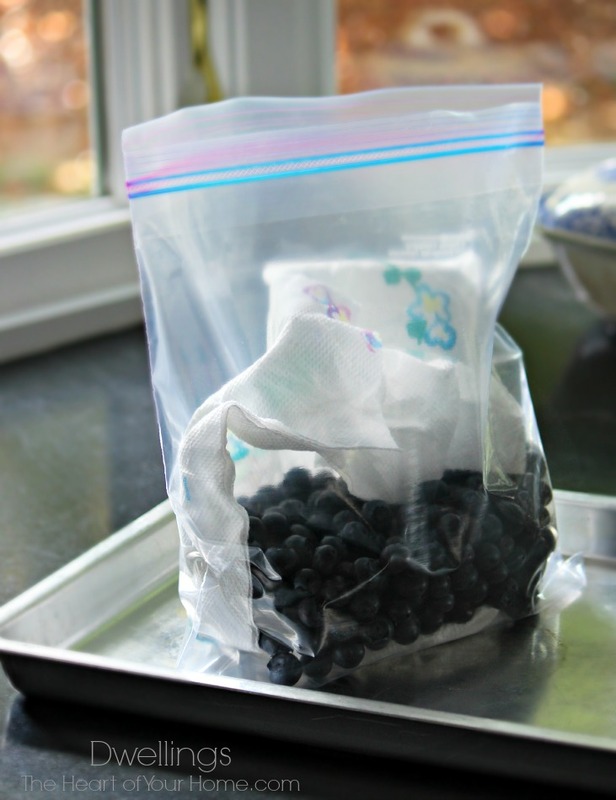 Once about 3/4 of the paper towel filled with blueberries are in the bag, I begin to curl the farthest edge and sides in until everything is in the bag. I then lift up the bag and remove the paper towel. Since there is plenty of room, I go to the next cookie sheet and begin adding the next batch to this bag using the same process. The blueberries are pretty much dry, so I fold over the top and try to remove as much air as possible before sealing the top. They are ready for the freezer, I lay them flat, placing one bag on top of the other in the freezer. 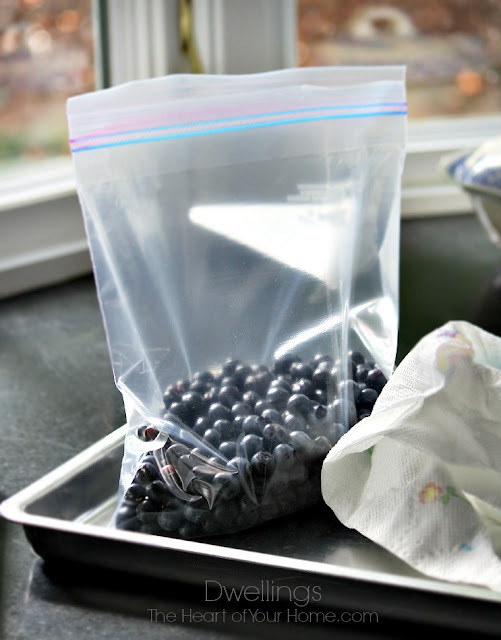 When we want some blueberries we just take a few or a lot from the bag; they are frozen hard like individual marbles. 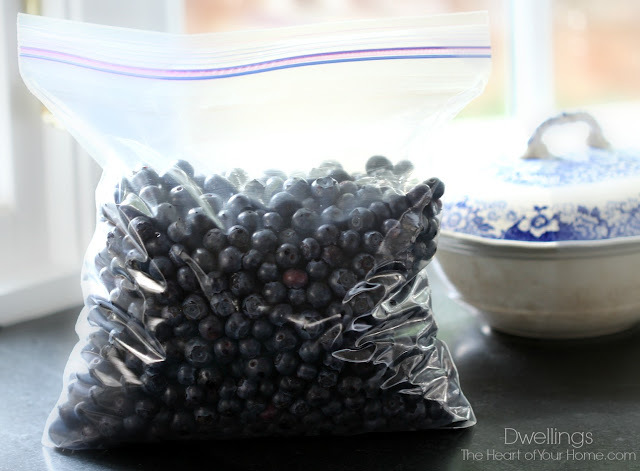 When a bag becomes empty, I leave leave it in the freezer until I have more blueberries that are clean, dry and ready to be added to the bags. 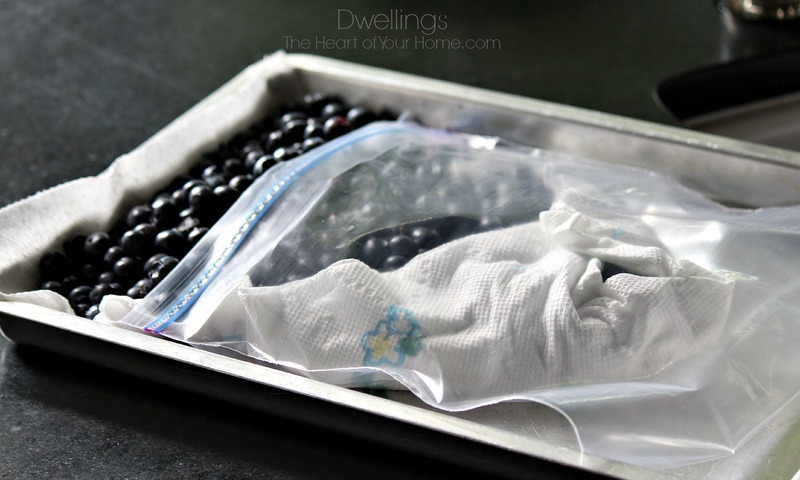 This way I can use the same bags time and time again, and by leaving them in the freezer there is no need to wash in between batches. 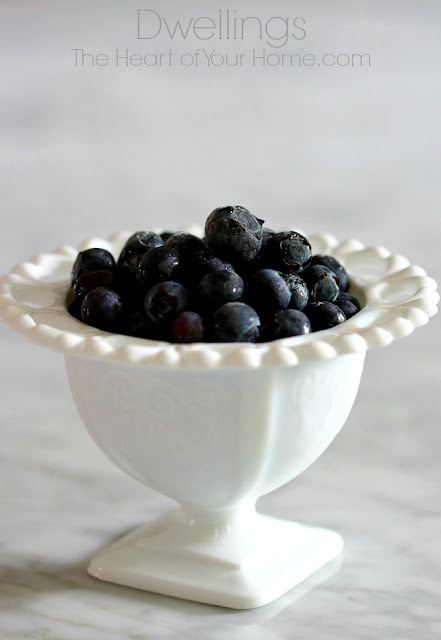 We love blueberries and by doing this we always have fresh, juicy blueberries ready to use! 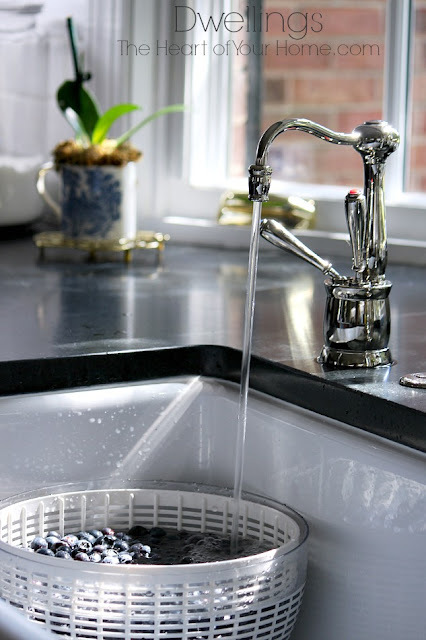 How about you...what do you freeze and what's your favorite kitchen gadget? and check out this week's features and inspiration here! Oh my Cindy, you've inspired me to start freezing fruit! Thanks for all of the tips, they sound great and quite easy! My kind of way, easy works best! I'm so trying to think of what my favorite gadget is, think it's my lemon and lime juicer! Oh and I do like to freeze leftover casserole, if it's not all eaten! Great post! I just checked the website of a local orchard to see if blueberries were ready to be picked and then I saw this. I think it's a sign that my freezer is in need of blueberries! I know you love having these on hand for recipes. I love blueberries. But I would never have the freezer room to freeze them. Great idea though! Blueberries are so yummy! I love that you use the salad spinner--very innovative. Thanks for the tip! I wish blueberries grew here because we love them! We do have an abundance of peaches here and we freeze them every year. We also freeze peas and tomatoes. 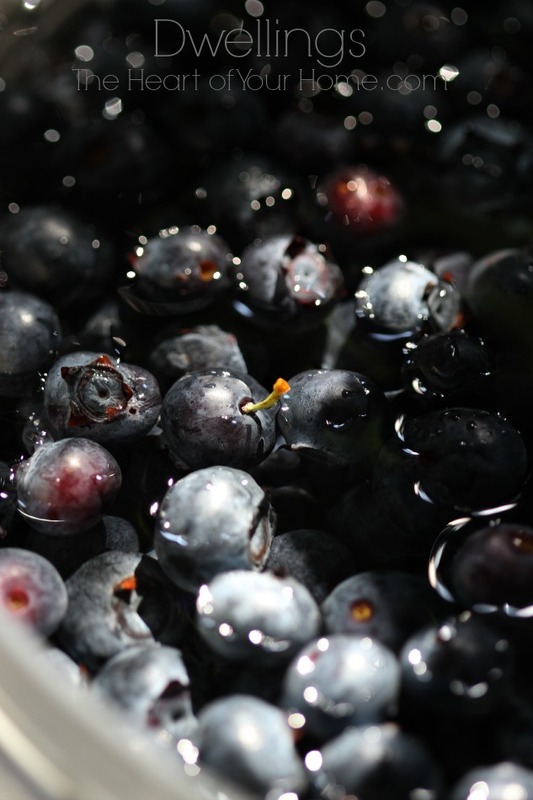 Blueberries are easy to grow, require very little attention other than a little fertilizer around the outside perimeter of the bush once a year. They grow a little over 6 ft but you can keep them cut back just after the fruit are picked. If you are in a zone where you can grow them I highly recommend it. We have about 6 blueberry bushes at our farm in N GA and we will soon have lots and lots of blueberries. 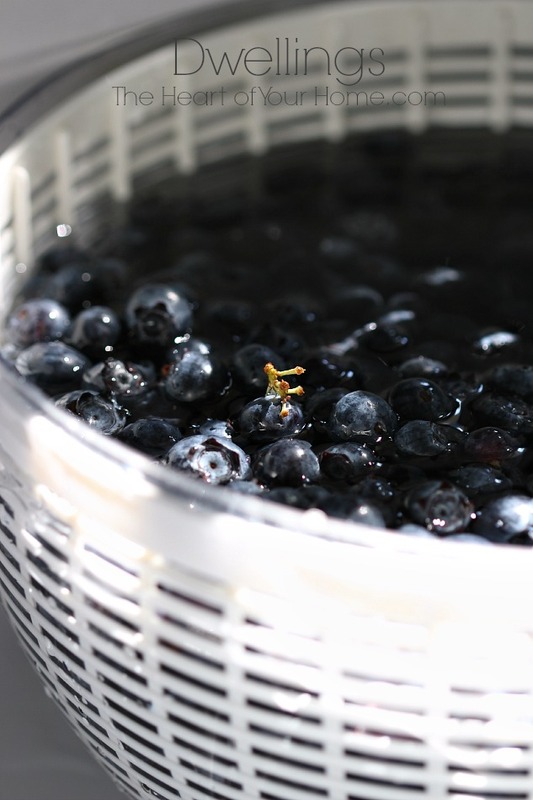 There is something very therapeutic about picking your own blueberries and putting them in the freezer for future use and the money saved feels good too. We eat a lot of blueberries. 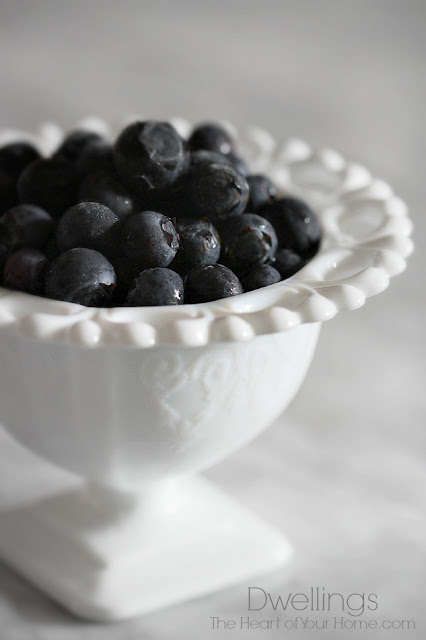 Hubby loves blueberries, maybe I should start doing this. Oh I do the same thing! 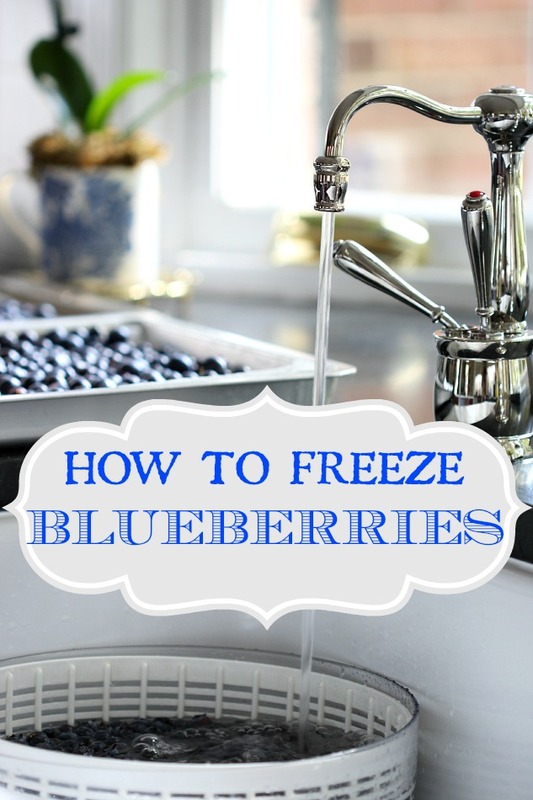 There is nothing like getting fresh blueberries that are local and ripe and then freezing them to enjoy all Winter long! Very nice tutorial and such pretty pictures too. My Mom used to freeze or can so much of her produce from her garden. With us being in an apartment while we build our French Country home, we have no garden and I'm missing it so. Hm~m~m. . .I may have just learned a "time~saving" method in freezing blueberries, dear friend!!! until frozen, then slide them into the bags. That way they don't squish each other. I do think I'll try your method next time and see if it saves time and I get the same end results!!! A favorite kitchen gadget. . .that would be my P~38!!! Such a great idea! I love blueberries too but almost never buy them because of the price. I'll have to start trying this during the summers!